Schedule and hold more meetings with ClearSlide web conferencing, for online meetings that just work. Avoid typical snafus of meetings that frustrate participants – whether it’s technical issues that delay meetings, waiting for participants to download plugins, difficulty in participants accessing or viewing online presentations, or finding the right content to answer questions. After the meeting, details and analytics can be auto-logged back to CRM. 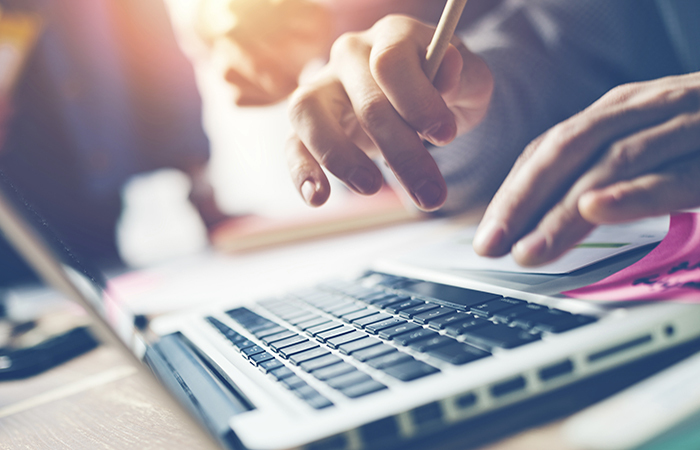 Reps will save hours in manual data entry, and Sales Operations teams will finally have access to activity data that reps often fall behind in completing. Meeting recaps include participant information, meeting length and notes, as well as slide by slide usage and customer engagement. 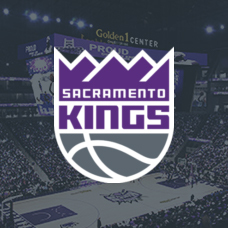 ClearSlide Replay complements the analytics with a full presentation recording to drill into specific customer questions and comments or use recordings as a tool for coaching or training. With easy screen-sharing and recommended sales content at your finger-tips, responding to customer questions as the meeting progresses has never been easier. 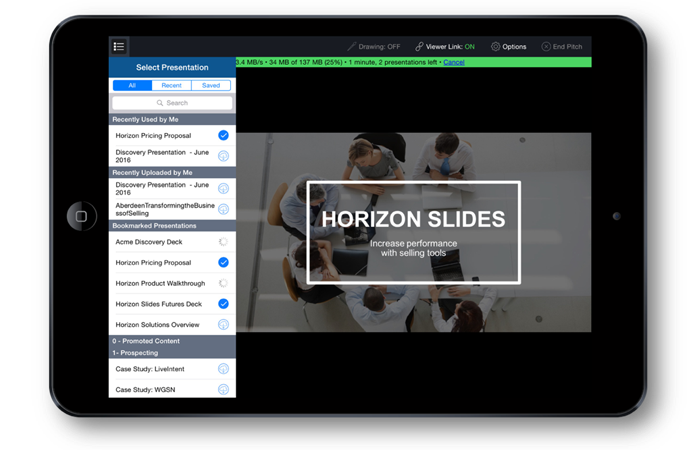 Keep presentations moving by switching between slides, content-rich media, web pages, and demos, while your participants experience seamless presentations. Presenters can even see when participants are engaged and focused on the presenter’s screen (or distracted and navigating to different screens). 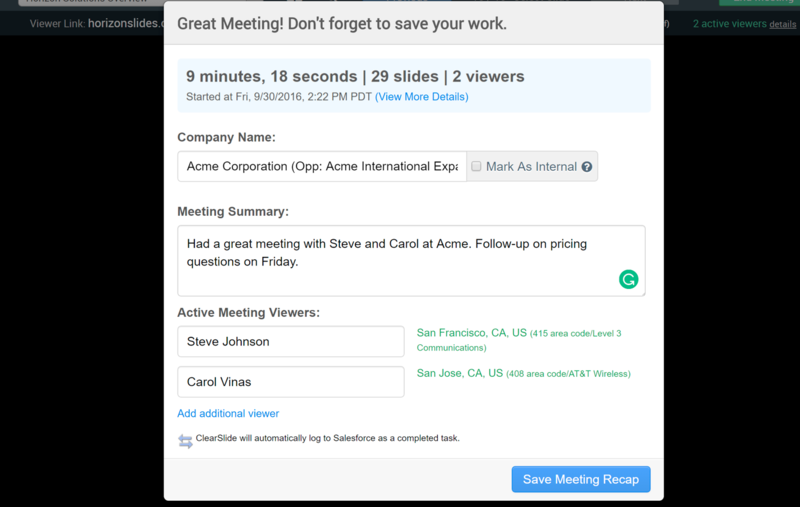 Instantly start or schedule online meetings from anywhere – your browser, email inbox, CRM, or Mobile Apps. 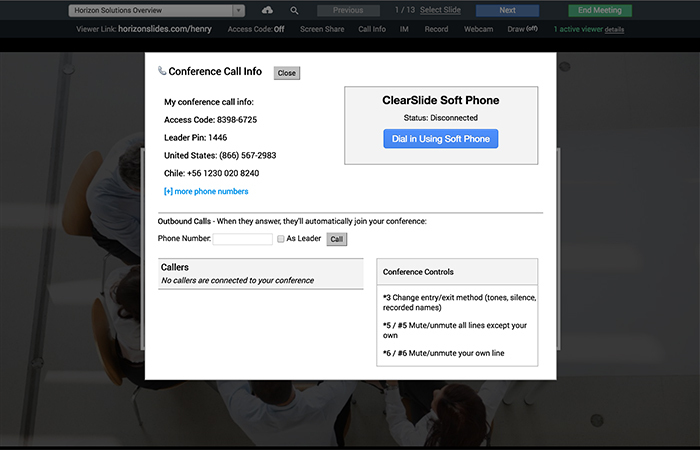 ClearSlide’s browser-based web conferencing does not require downloads, plugins, or complicated logins for viewers and works across platforms. Whether used for demos, online training, or remote trouble-shooting session via screenshare, ClearSlide web meetings are tailored for interacting with your customers and buyers. You can also pass control of the web conference to another member of your team – or even a participant. 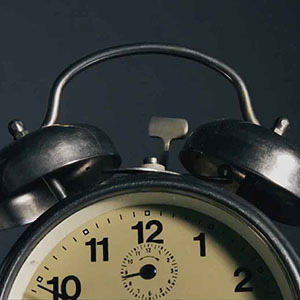 Schedule meetings in advance – or meet instantly. You can create your own personal URL which acts as your personal online meeting room. Ask viewers to simply “jump on your link” to instantly start online meetings, share your screen, and present the richest content. You can schedule and start meetings and web conferences with your own dedicated and personal URL. Participants click on your personal link to instantly join your meeting and engage with compelling content. Dial in with high fidelity audio from your phone or computer, or even have the meeting call you. 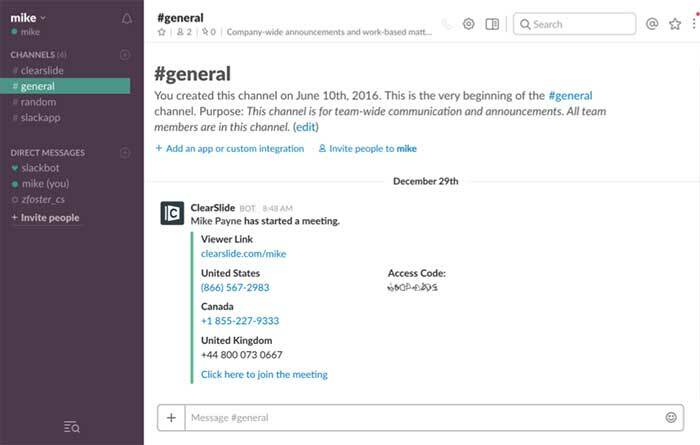 Start meetings directly from the ClearSlide web app, Outlook, Gmail, Slack, and CRM. Eliminate separate web conferencing software and online meeting software with a high-quality platform that integrates content, communication, and analytics. Add enterprise-grade audio conferencing to any ClearSlide meeting – no need to manage multiple conferencing services. Worldwide coverage, toll-free, local numbers, and VoIP options make it easy to for customers and prospects to join your meetings. ClearSlide Meetings include integrated audio conferencing and video conferencing, supporting internal or external meetings worldwide. With dial-ins for over 70 countries and integrated VoIP, you can feel confident in reliability, scalability, and security. 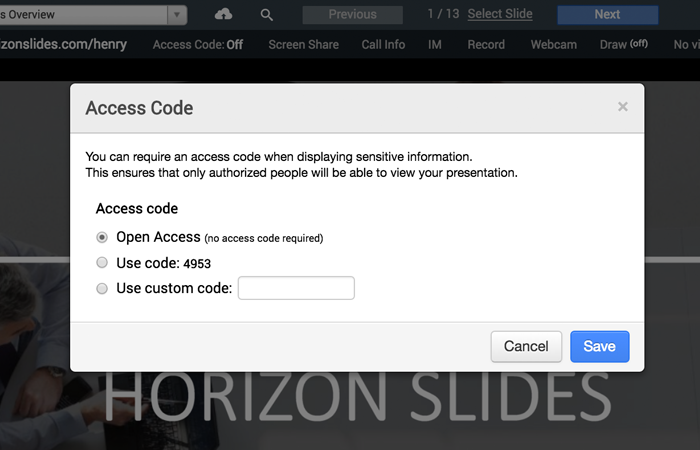 For additional security, you can enable access codes for participants as a gateway to control access to your web conference. Advanced security and compliance features allow automatic recording of meeting details or full meetings and mandating use of access codes. 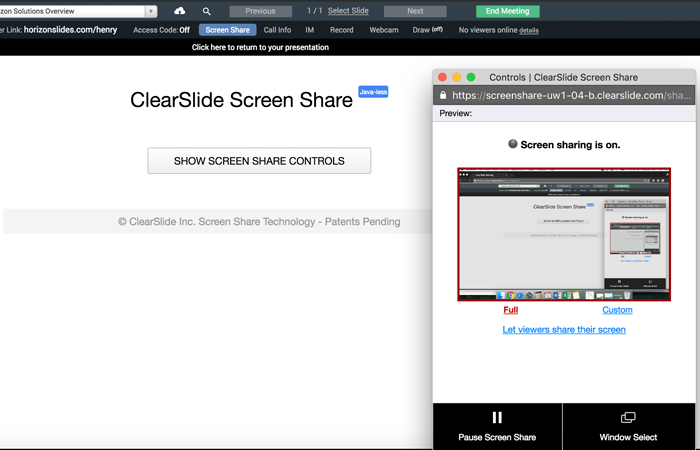 High-quality Screen Share allows you to share your desktop or individual apps – perfect for demos and collaboration. Low latency and high frame rates ensures that your viewers see the presenter’s screen in real time. Always have the right content available for meetings – at the right sales stage. Easily access approved and recommended content on-the-go, and even when offline. Seamlessly switch between presentations, screen-share, websites, and high-definition video content. 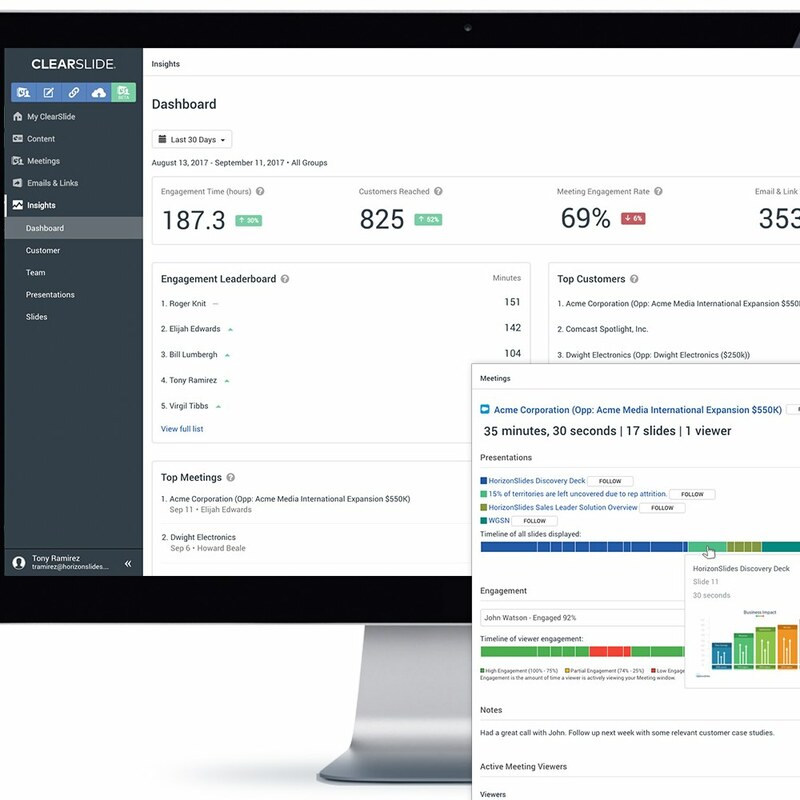 ClearSlide provides a single sales hub for all sales content – rich content, email templates, video libraries, and integrations into other cloud storage repositories. Integrated content management ensures that your value proposition comes to life in every online meeting and you deliver an amazing sales experience. Capture key information from every meeting – roll call functionality records who attended, how long the meeting lasted, what content was covered, and whether participants were engaged. 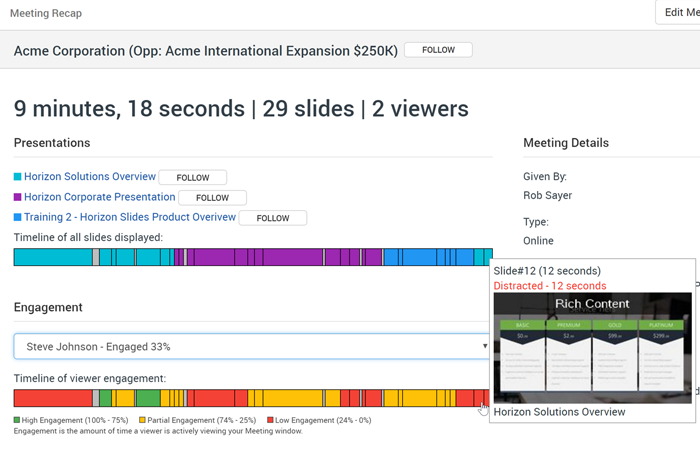 After the web conference, analytics automatically capture meeting details on a slide by slide level. Reps can also provide additional, customized meeting notes. Activity and engagement analytics are all auto-logged to CRM – saving sales and service reps hours in manually entering information into CRM. 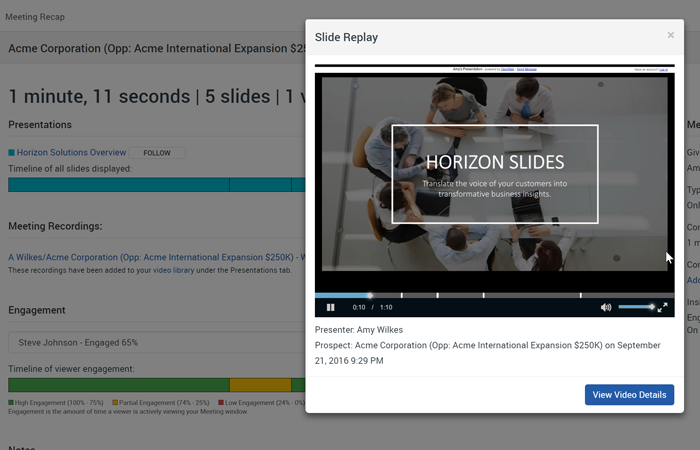 Slide-by-slide engagement data and rich Activity Insight Cards allows sales reps to respond faster and with more context. Managers can use the analytics to coach with better insights and share best practices. After every meeting – including meetings using the ClearSlide mobile apps – users are prompted to capture meeting notes, new and existing contacts, and other details. These details are combined with detailed engagement analytics and can automatically log back to CRM, providing exceptional visibility into every customer interaction. Replay and recording capabilities to capture full meeting recordings – including presentations, customer questions, and responses. Tailored use cases include account management, real-time coaching, or to create a comprehensive library of best practice presentations and trainings. Access controls ensure that every meeting is secure – and can be set organization-wide or at the team level. Capture meeting attendee details by leveraging the roll call functionality – allowing attendees and new contacts be auto-logged directly into CRM. Use advanced compliance features to automatically record meeting details or recordings.